Kate recently retired from the Royal Australian Navy after 17 years of service, and has started a new career as an Air Accident Investigator. She is also a keynote speaker who is keen to share her knowledge and experiences with others. Kate inspires and motivates audiences to overcome challenges, and achieve their goals. I have never had a 9 to 5 office job. I have never worked in the private sector. I can’t tell you how to run a successful sales, marketing or finance department. But I can comment on the fundamentals of self-motivation, leadership, effective communication, decision making under extreme pressure and ultimately what it takes to be successful. I am going to offer you a different perspective to what you are used to in your day to day lives. It's a perspective that is every bit as relevant to you as an individual, and your organisation. My name is Kate Munari and I spent 17 years as a helicopter pilot in the Navy. I have flown in Australia, Kenya, Germany and the UK, culminating in the pinnacle of my career to date flying with Commando Helicopter Force. Much of this was in some of the most intense operational situations in modern wartime history, during 3 tours of Afghanistan flying in support of the UK’s Royal Marine Commandos. There are several key aspects to my career success. It's absolutely fundamental to have a thorough understanding of my goal and motivation towards achieving it. If you can’t understand the why behind wanting your goal, then you can’t plan properly plan for the journey or be prepared for the hard times along the way. Goal setting and creating a plan to achieve the goal, is the area where I can add valuable insight. I have had to overcome extreme odds and adversity to achieve my goal of becoming an operational military pilot. I was proud to be the first and only Australian female pilot to serve with Commando Helicopter Force, in fact the only female amongst a workforce of 150 male front line pilots and air crewmen. That said, rising in rank to command positions that are not the traditional domain of a woman in the military, was due to skills that both men and women can attain. Being out of my comfort zone physically and mentally, as well as operating in extreme circumstances and pressures, has helped me develop a set of tools for conquering all manner of challenges. My journey towards career success had unexpected benefits, such as meeting Royalty, travelling the world and commanding a formation of helicopters under fire in Afghanistan. On numerous occasions, I made decisions that lives depended on. I look forward to taking you along for some of those missions, so you can find out firsthand how I made those calls and more. If you would like to know more about Kate's keynote presentations or corporate training options, contact us for more information, call 1300 55 64 69. Kate grew up in Sydney and joined the Royal Australian Navy at the age of 18 through the Australian Defence Force Academy, ADFA, completing a Bachelor of Science degree. 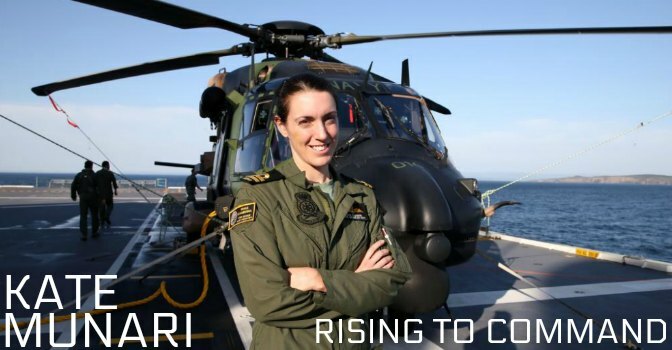 Qualifying as a helicopter pilot in 2006, her skill and dedication to flying, lead to her being selected for a four and a half year posting to the Royal Navy, UK. There Kate flew as part of Commando Helicopter Force, CHF, who fly in support of the Royal Marine Commandos. Read more.